Prelude: You ain’t nothing but a Hound bot, fighting all the time! So, uh, Siege Hound! Here we go! Robot Mode: In many ways Hound is a pretty straight-forward adaption of the original G1 Hound toy. 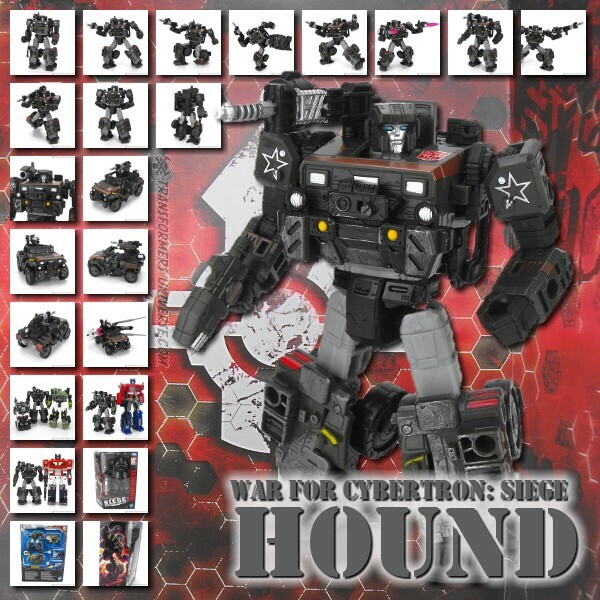 He has the same cubic design where he almost looks like a stack of different-sized boxes, the chest design is spot on, and even the coloring is near-identical (much darker than that of Universe Hound, for example). So in terms of character recognition there really isn’t any doubt, this is Hound. Naturally the figure has quite a few advancements over the classic Hound, such as excellent articulation. Hound can pull of kneeling poses, kicking poses, and all sorts of combat moves, no problem. He’s got tilting ankles, twisting wrists, the works. The detailing is classic G1 Hound, too, especially the stars on the shoulders (though one has to wonder whether those mean ‘General’ on Cybertron, too). Hound also comes with battle damage detailing, like most Siege figures, but where it looks strange on some figures, it looks really cool here. It’s restricted to the “metal” plates on his torso and shins and looks really great, no complaints here at all. In terms of weapons Hound comes with two separate guns (a short “Electro-Scope Launcher” and a bigger “Holo-Beam Refraction Blaster”) and a separate drum magazine that can be added to either weapon. All three components can also combine into a bigger weapon (the "HD Vector-Beam Mega-Blaster"). Hound traditionally has a single shoulder gun on his right shoulder and you can plug in either weapon there (or on the left, too). There is some limitation here, as a black plate from his back is directly behind the 5mm port, making it difficult (though not impossible) to plug in the Electro-Scope Launcher. The larger blaster fits much better. Hound is also covered in 5mm ports to plug in additional weapons and features plenty of small pegs to apply blasting effects from the Siege Battlemasters, too. Very nicely done. All in all Hound is a total package in robot mode, a great figure. Great articulation, great look, great detailing. Alternate Mode: This being the pre-Earth version of Hound, he naturally transforms into a Cybertronian vehicle that merely LOOKS like an Earth-built military Humvee, but certainly isn’t one. No sir, no way! Pay no attention to the markings that closely resemble those found on an Earth military vehicle reserved for one-star generals, it is a mere coincidence. Jokes aside, Hound looks pretty good in vehicle mode, though quite different from his G1 form. His weapons can be mounted on top or on the sides, the cockpit shows individual seats, and as many as four additional weapons can be mounted, too. Also, the level of detailing is great, especially on the front. So bottom line, no complaints here, either. Well, one maybe. Hound barely has any clearance under the vehicle due to the robot mode arms being there. He can still roll without dragging, but it’s close. Apart from that, though, no problems. A great vehicle mode. Remarks: For all that G1 Hound was the only one among the original Autobot crew to transform into a military vehicle, he sure was a peace-loving guy. Hound has changed since those days, though. His live-action incarnation especially was all about the guns and warfare and less about the peaceful exploration of alien planets. But this here isn’t Movie Hound, of course, but rather Siege Hound, who is more or less G1 Hound, but probably too busy fighting a war on Cybertron to be peace-loving and exploring. Just a guess, we don’t really have a story for the Siege toy line yet. I still clearly remember saying something along the lines of “I don’t need a new Hound, I got the Universe version.” As a matter of fact I remember quite a few people saying that. Well, time to eat those words. While Universe Hound is still a great figure, mind you, Siege Hound is better. Not much better, but better. In fact I’d call him a near-perfect Deluxe-class Transformer with but miniscule problems (the shoulder gun and the lack of clearance in car mode, can’t think of anything else). So bottom line: unless you’re totally not a fan of Hound or are offended by a Cybertronian vehicle looking exactly like an Earth-style Humvee, Hound is definitely a figure you should look at.